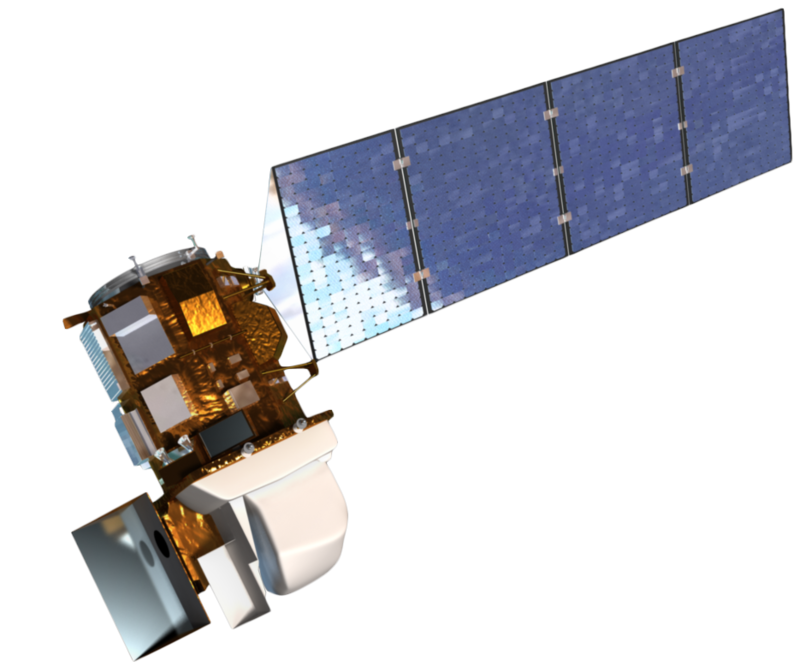 Drawing of the Landsat 8 observatory. The spacecraft will supplies power, orbit and attitude control, communications, and data storage for OLI and TIRS. The spacecraft consists of the mechanical subsystem (primary structure and deployable mechanisms), command and data handling subsystem, attitude control subsystem, electrical power subsystem, radio frequency (RF) communications subsystem, the hydrazine propulsion subsystem and thermal control subsystem. All the components, except for the propulsion module, are mounted on the exterior of the primary structure. A 9 × 0.4 m deployable solar array generates power that charges the spacecraft’s 125 amp-hour nickel–hydrogen (Ni–H2) battery. A 3.14-terabit solid-state data recorder provides data storage aboard the spacecraft and an earth-coverage X-band antenna transmits OLI and TIRS data either in real time or played back from the data recorder. The OLI and TIRS are mounted on an optical bench at the forward end of the spacecraft. The spacecraft without the instruments is approximately 3 m high and 2.4 × 2.4 m across with a mass of 2071 kg fully loaded with fuel. Adapted from Remote Sensing of Environment 122, James R. Irons, John L. Dwyer, and Julia A. Barsi , The next Landsat satellite: The Landsat Data Continuity Mission, 11-21, Copyright 2012, doi:10.1016/j.rse.2011.08.026, with permission from Elsevier. Courtesy of the journal Remote Sensing of the Environment.